Wooden Toy Tool Box Bench is an ingenious wooden toy for all those pretend play handyman jobs around the house. This tool box carries the 12 wooden tool but also flips over to become a work bench complete with working vice. 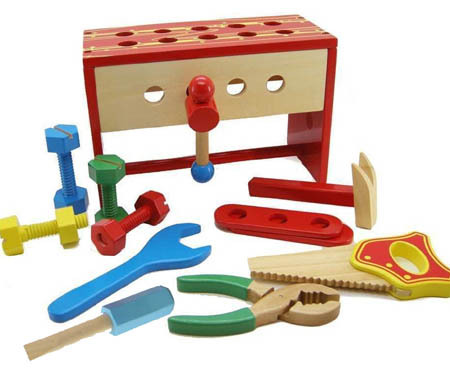 The included tools are 4 wooden bolts with nuts, 2 boards with 3 bolt holes, hammer, saw, wrench, pair of pliers, and flat-head screwdriver. A great toy for role play and helping around the house. A very strong toy with multiple uses. We like this because: "Well made and love that the tool box is also a bench "